Consider the value that the Empire DVCP36BP70N Tahoe Direct Vent Fireplace will add to your living space. 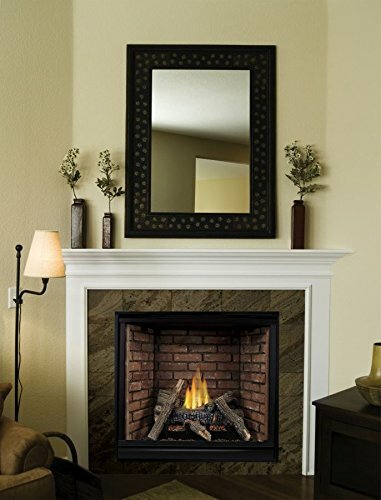 This traditional-looking fireplace is a classic, and includes features that make it a delight to use. The tempered-glass view window gives users the feel of relaxing by the fire without the risk of injury from drifting sparks. A rustic-brick liner makes a strong visual statement, whether the fireplace is in use or not, and the burner creates a realistic fire effect with its artistically crafted flame pattern. Buyers must purchase the coordinating ceramic log set separately. Talk to your dealer about installation and warranty availability. Is flame adjustable on this model (electronic ignition)? The flame is not adjustable on this unit. Does it come with the mantle? No, this fireplace does not include a mantel.